Today’s announced $13.7 billion acquisition of supermarket chain Whole Foods has established Amazon as a major player in the grocery business. More importantly, however, the deal has established ecommerce as a major player in the grocery business and has further blurred the line between digital retail and physical retail. Amazon has been trying to make its mark on supermarkets for some time now, most notably through its grocery delivery service AmazonFresh, which debuted all the way back in 2007. With this purchase of Whole Foods, Jeff Bezos’ company has finally made significant headway in that endeavor. The deal makes sense for Amazon for a number of reasons. First and foremost, it moves Amazon fully into the grocery industry, a sector whose annual U.S. sales are in the ballpark of $700 to $800 billion. With Whole Foods, Amazon picks up one of the largest grocery chains in the world, with over 460 stores in the U.S., Canada, and Britain and about $16 billion in annual sales. Secondly, it gives Amazon access to dozens of brands who may not be selling on Amazon.com today. In addition to the more obvious assets that Amazon will gain control over, there is tremendous value in being able to immediately establish relationships with new brands who are selling in Whole Foods stores. Obviously, Amazon has hundreds of millions of products on its site. In the grocery category, however, it is noticeably lacking in its number of SKUs and number of brands. This acquisition should help fix that. 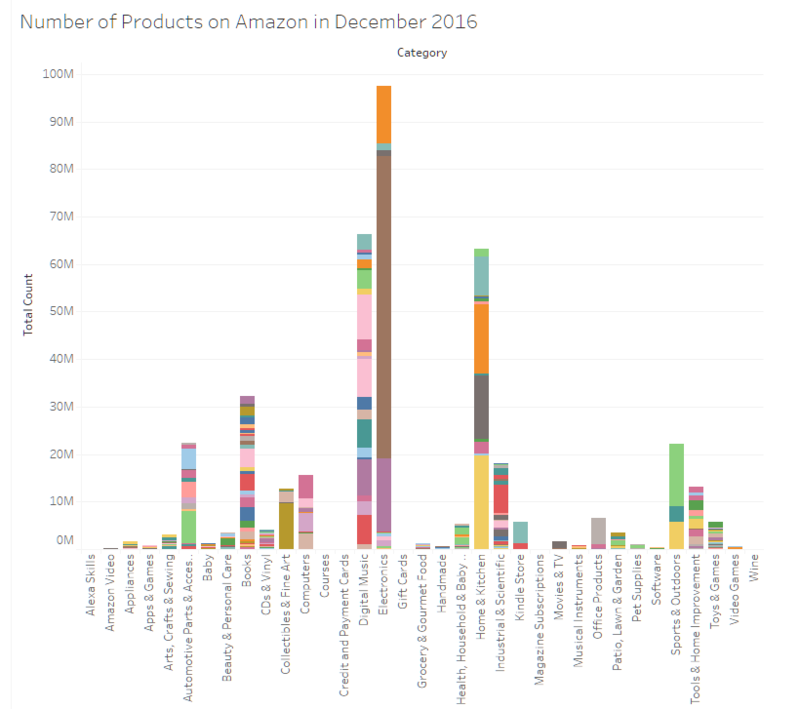 A representation of Amazon’s current dearth of grocery merchandise can be seen in the graph below, courtesy of the website ScrapeHero. A third reason why Bezos has to be thrilled about this deal is that Whole Foods has a significant consumer footprint with high-income households. While Whole Foods’ investors were growing impatient with the company’s lack of growth, it remains extraordinarily popular, which, coupled with its high-priced merchandise, is a welcome revenue boost for Amazon in its ongoing competition with the increasingly ecommerce-focused Walmart. Finally, and perhaps most importantly, this deal is so monumental for Amazon because of the 460+ brick-and-mortar Whole Foods locations that have just come under its control. Amazon has been taking steps in recent years to establish physical sites that would help expand its influence over the entire retail industry and improve its already legendary supply chain and fulfillment capabilities. This acquisition is a giant leap in accomplishing that goal. Now that it’s associated with hundreds of Whole Foods stores, Amazon can increase same day delivery options for Amazon.com customers and offer physical items to foot-traffic shoppers. Convenience and product assortment are perhaps the two most important qualities for consumers when they shop; Amazon is now primed to stand head and shoulders above the competition in that respect. What does that mean for the rest of the retail world then? If you are a grocery retailer—or any retailer for that matter—it means that optimizing your product assortment and supply chain has become that much more important. A dropship program or marketplace is the best way to do that, especially when considering both scalability and overhead cost. Not everyone has the resources to go out and buy a multi-billion-dollar grocery chain and ramp up their SKU mix and logistics capabilities that way. Through dropshipping though, you can drastically (and easily) improve both of those parts of your business, selling thousands more SKUs and facilitating their shipment direct to the consumer. A dropship marketplace helps insure your consumers can access every product that would be attractive to them, increases operational efficiency, and provides you with the ability to thrive in the future. Amazon and Whole Foods are an undeniable force to be reckoned with, but retailers can remain more than competitive.